Junana takes you to the present you wished were already here. Junana tracks the arc of a new society in an alternative present time, using concepts and technologies that are mostly available today. Junana displays the future of education that many top scholars in the field are beginning to discuss. The eventual convergence of Internet gaming and education will put powerful learning tools into the hands of teens. In Junana we follow several of these teens as their world explodes through their Game experiences. In Junana the future is now, and we are all gamers. 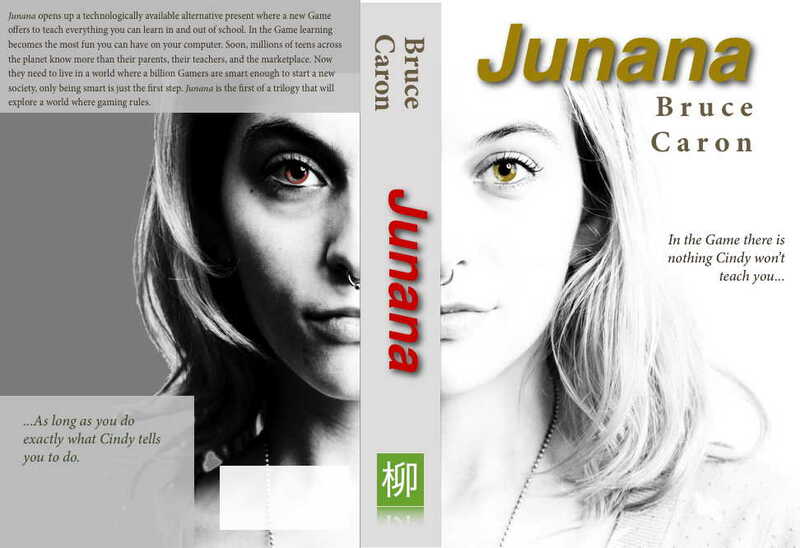 Junana is the beginning of a series of books that lead the reader into this new present. 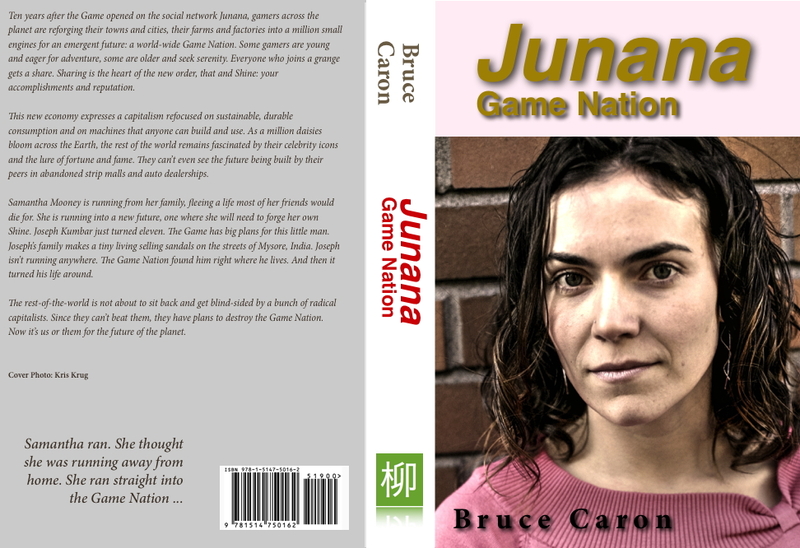 The next book, Junana: Game Nation, explores the impacts of a new society of gamers creating the first non-place-based polity. This could mean war. Junana: Game Nation. Ten years after the Game opened on the social network Junana, gamers across the planet are reforging their towns and cities, their farms and factories into a million small engines for an emergent future: a world-wide Game Nation. Some gamers are young and eager for adventure, some are older and seek serenity. Everyone who joins a grange gets a share. Sharing is the heart of the new order, that and Shine: your accomplishments and reputation. This new economy expresses a capitalism refocused on sustainable, durable consumption and on machines that anyone can build and use. As a million daisies bloom across the Earth, the rest of the world remains fascinated by their celebrity icons and the lure of fortune and fame. They can’t even see the future being built by their peers in abandoned strip malls and auto dealerships. Samantha Mooney is running from her family, fleeing a life most of her friends would die for. She is running into a new future, one where she will need to forge her own Shine. Joseph Kumbar just turned eleven. The Game has big plans for this little man. Joseph’s family makes a tiny living selling sandals on the streets of Mysore, India. Joseph isn’t running anywhere. The Game Nation found him right where he lives. And then it turned his life around. The rest-of-the-world is not about to sit back and get blind-sided by a bunch of radical capitalists. Since they can’t beat them, they have plans to destroy the Game Nation. Now it’s us or them for the future of the planet. Junana: Game State. It has been twelve years since the day the Game opened across the planet. Nine years ago the first grange set up shop. A shared hacker/maker space and basic living quarter, it became the model for two million granges world-wide. A hundred and fifty new granges open every day. That’s like a new city being born each day. The grange pulls its assets out of the rest of the world—these will not be returned. Every grange has a couple of goals. Inside them, poverty is impossible. Through them, members access the tools and lessons that propel their lives forward every day. Because of them, the planet is approaching a carbon-neutral future. When Michelle—a rogue artificially intelligent code that was spawned by the Game— disappears tens of trillions of dollars from super-secret off-shore banks, the rest-of-the-world strikes back, wrecking the Game’s platform. Even if Michael O’Hara and his friends and their teams save the Game code, it’s clear that Gamers need to go on the offensive. Across the planet, hundreds of millions of Gamers become politically active. They target those elements of their national political parties that are most disruptive to the notion of reform. Instead of challenging these parties externally, they join them and overwhelm them from inside. Fifty million new-Republicans in the US elect their own candidates for congress. They contest all elections at every level. Within a couple years, the Republican Party holds solid majorities across all of the states. But it no longer controls its own membership, not their new platform. Once in power, Gamers use their collective talents to refigure the political landscape. In a world where poverty is impossible, is there any need for a state or a nation? The next step will remap the planet, leaving no territory claimed by historical powers. The armies are folded back into civil life. Corporations dissolve as their capital dwindles. The planetary map no longer shows national boundaries. Nobody misses them.